I want to thank you for being an All-Access member in 2014. You are our biggest supporters -- truly the heart and soul of Planet Waves. Your support makes each article, horoscope and reading possible. This means we're able to thrive without any outside advertisers. We're accountable to you, and our individual consciences. That's it. With your help (thank you again! 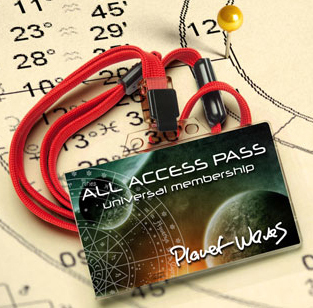 ), we are putting the finishing touches on our members.planetwaves.net. This will truly be an All-Access site, soon to include all of our writers, Eric's horoscopes and all audio readings -- including a streamlined version of the annual edition (also on its own site). I just learned that this will also include The Oracle, Daily Astrology, SMS messages and all of our bloggers. This has been a long time in the making, and our software engineer tells us he has about one more week of work, then we will announce our launch date. You'll have your own login and password with easy access to all of our premium content in one place. By the way -- since you really do have ALL access, you will also have access to all of the services we're creating for Core Community Level, including teleconferences. A brief word about the annual edition -- this year it's called COSMOPHILIA: YOU BELONG HERE. We'll be raising the price incrementally over the next few weeks (beginning Friday, Sept. 5, until we reach the final rate of $499), so now really is the time to get the best rate on your renewal. I know that Eric looks forward to serving as your astrologer in the year ahead. We're glad to have you with us.